What’s worse than being in one of the first big distracted-by-Pokémon Go crashes? Doing so in your brother’s car. 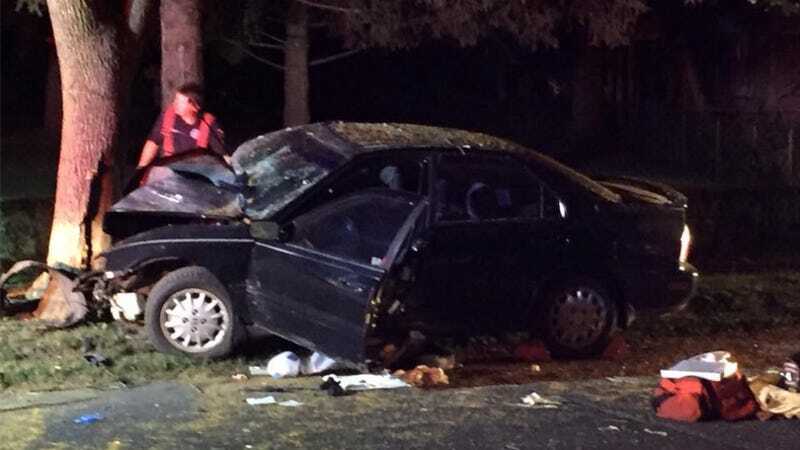 The 28-year-old who caught a tree while playing the popular game wasn’t even driving his own car—it was his 20-year-old younger brother Zachary Cary’s ride. I saved up my earnings from my first job in high school to buy that car. I spent a year fixing it and investing more money in it to make it roadworthy. Then my brother wrapped it around a tree in hot pursuit of a pokemon. I didn’t even know he was driving my car that night until I heard about the crash. The scrap metal formerly known as car had no collision coverage. Incredibly, my brother is alive and well, and I do dearly hope he will learn some harsh lessons about road safety. Given that Cary’s location is listed as Portland, Oregon, instead of in New York where the car was crunched, his story sounds plausible enough. Next time, I recommend hiding the keys a little better and/or instructing whoever has access to said keys not to loan the car out. Cary also claims that he was going to sell the car to save up for an emergency fund anyway, but obviously, he’ll get a lot less for the car now that it’s got a giant tree-shaped crunch in the front. While I certainly feel for the guy, his older brother and/or whoever was watching his car back home in New York should probably be the ones chipping in for the cost of the car that got wrecked. You break it, you buy it.